Rugby Town’s Jekyll and Hyde week ultimately solidified their place in the Southern League Central Division play-off zone, ahead of their trip this Saturday to Godalming. Dave Stringer’s side responded well to the weekend’s disappointing 2-1 defeat at Potters Bar, with a comfortable 3-0 midweek win at St. Ives to re-establish a three point gap between them and fifth placed Royston – with Barton and Hanwell now a further four points behind, both of whom have two games in hand on Town. With Aylesbury and Bedworth above them still within touching distance, it really is now any four from six for the end of season play-off jamboree, although many more performances like the one in Hertfordshire last Saturday could easily see Valley slip out of contention. Rugby’s win at St.Ives ended their Tuesday evening away league fixture hoodoo, which had seen them fail to win in their five such previous games. Last season’s title bid ultimately floundered on the back of a string of poor displays on the road towards the end of the campaign, and again Town were easily beaten earlier this season on a Tuesday night at Northwood. 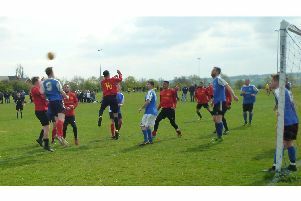 Striker Richard Gregory maintained his excellent scoring form with a goal in both games over the past week, taking his tally to nine in nine league starts, whilst against St.Ives, Valley coped well with the absence of captain Alex Gudger from the heart of their defence – with keeper Richard Morris recording his eighth clean sheet in a Valley shirt since his signed from Daventry towards the end of October. Gudger’s badly damaged ankle means he is likely to miss out again this Saturday at Godalming, with Lewis McBride also continuing to struggle with his knee injury. Saturday’s opponents are currently in 9th place in the table following their midweek reverse at Marlow, however this was only their second defeat in their last ten league outings. Having acquitted themselves well in their first season within the Southern League structure in 2012/13 – finishing four points shy of runners-up Town to secure a place in the Central Division play-off semi-final, the G’s then struggled in the South & West Division the following year before being transferred back over for 2014/15. The reverse fixture between the two sides earlier this season at Butlin Road saw Rugby record a 3-0 success – thanks to goals from David Kolodynski, Sam Youngs and Justin Marsden. # The club coach to Godalming will leave Butlin Road at 10.30am. For latest information, contact Tony Mann on 07970 691366.